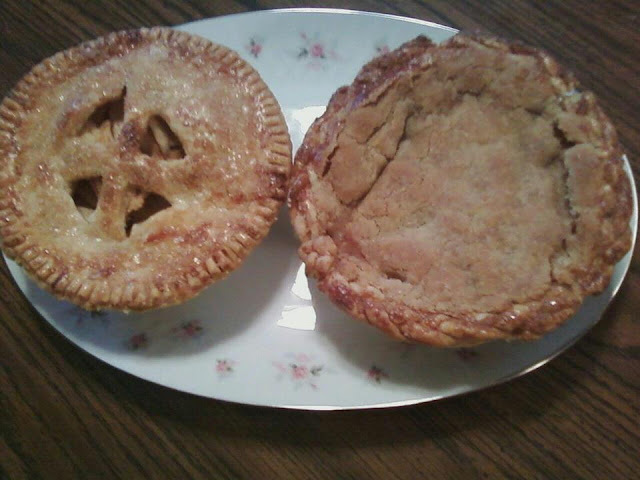 The one with the cut outs is the regular apple pie and the right is the French version. I just like both kinds of apple pie! Couldn't decide so I made both! Mine are mini pies. But the recipe below are for standard size pies. Mix together flour and salt. Cut in the shortening and sprinkle with the water. Gather the dough together and press into a ball. Divide the dough in half, shape each half into a ball (one at a time), on a lightly floured board. Flatten each ball with your hand, and roll it out. Work quickly and roll lightly, being careful not to add extra flour as that makes the pastry tough. If the pastry breaks apart, pinch the broken edges together. Roll the pastry out into a round at least 11 inches in diameter and about 1/8 inch thick. Fold the pastry in half. Quickly transfer it into the pan. Unfold, and pat the pastry down to fit the pan. Avoid stretching. Trim off the overhanging edges with scissors or a knife. (It is not necessary to chill the pastry.) Roll out the other half of the dough for the top crust a little thinner than you did for the bottom crust,large enough to extend 1 inch beyond the edge of the pan. Mix together sugar and cinnamon and/or nutmeg. Toss lightly with the sliced apples. Place the apple filling in the pastry-lined pan and dot with the butter pieces. Fold the pastry for the top crust in half. Make several slits or cutouts near the center to allow steam to escape, otherwise the top crust will puff up leaving a hollow space underneath. Carefully place the folded pastry evenly on top of the filling. Unfold. There should be a 1 inch rim of pastry beyond the edge of pan. Trim off any extra edges. Fold the extra edge of the top pastry under the edge of the lower pastry. Seal thoroughly by pressing together onthe edge of the pan. Build up a fluted edge. Form crimped fluting between thumbs and forefingers. Brush egg wash (1 beaten egg with 1 tablespoon of water) over top of crust and sprinkle with sugar. Bake at 400F for about 50-60 minutes. If the edges start to brown too fast, you can cover the edges with foil to prevent burning. Mix together flour and salt. Cut in the shortening and sprinkle with the water. Gather the dough together and press firmly into a ball. Roll it out into a round at least 11 inches in diameter and about 1/8 inch thick. Fit the pastry loosely into the pan. Avoid stretching to prevent shrinking. Trim off ragged edges with scissors or knife, leaving 1/2 inch overhanging the edge of the pan. Fold extra pastry back and under, and build up a high fluted edge to hold a generous amount of filling. Mix together sugar and cinnamon and/or nutmeg. Toss lightly with the sliced apples. Place apple filling in the pastry-lined pan. Cream butter and brown sugar. Cut in the flour. Sprinkle the top with the crumb topping and bake at 400F for 50-60 minutes.